Margaret Sheri, Parent Coordinator (and school garden organizer), at PS 102 gave me this Birds-nest Sansevieria (Sansevieria trifasciata 'Hahnii'). Now there are seven of them growing new roots in recycled 2.0 pop/soda bottle planters. Soon they will go back to the school and grow on the shelves of their new light garden which will produce "green desk plants" for classrooms. 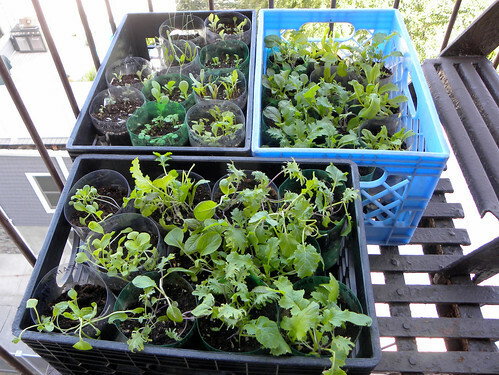 The children in PS 102 will quickly learn some plant science basics and the benefits of sub-irrigated planters (SIPs). While doing this, they will also learn about repurposing plastic bottles into objects of significant value. These light gardens are from a post on Apartment Therapy. It's good to see a post on this valuable subject. Unfortunately there is little or no information about a better solution. My recommendation is none of the above. Buy an InterMetro style adjustable rack. You can buy a 4’ wide, 6’ tall, 18” deep rack with 5 shelves and 4 casters for about $100 at Costco. Seville Classics is an importer of these racks. The shelves are adjustable in 1” increments to provide the ultimate in versatility as your plant sizes change over time. Further, when you use sub-irrigated planters, there is no need for drainage. You do not need messy trays under the plants. Will the green home of the future have L.E.D lighting sufficient to maintain decorative plants or even better to grow edible plants? This article from The New York Times is encouraging. Incidentally I read this article in context of how misinformed the Times reporters can be regarding the maintenance and growing of container plants. That is a subject that I'm qualified to critique professionally. However, I simply don't know enough about L.E.D. lighting technology to analyze this article in detail. If you do, please comment for the benefit of other readers. Here are some reader reviews of the article. There is obviously significant money betting on an L.E.D. future. Will the living plants sector of the “green” movement be a significant player? Only time will tell, but the past is not a good precursor of the future. Hopefully, projects like the “Smart Home” in Chicago, will soon demonstrate the use of L.E.D. plant lighting along with sub-irrigated planters. It will certainly make these homes a lot greener. Okay, so it's not a real "vertical farm". Think of it as an embryonic vertical farm. We need to start some where other than the outdated clay pots and saucers inside many of our homes and offices. They were only modern in the time of the ancients. 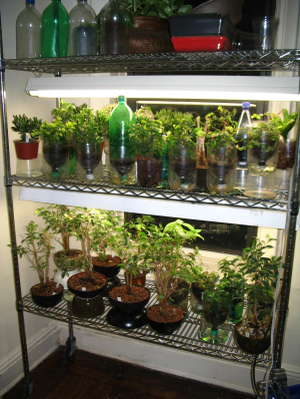 This is one of the Inside Plants Science Mini-Labs that is now in my Brooklyn apartment. This is what should be (but isn't) in the science lab of every school in America. If it were, we would be a lot further along in science education. We would be a lot further along a path to more local food production. As it is, due to a lack of up-to-date information most of us are still crawling in a horticultural kindergarten. What you’re looking at is an investment of under $100 for a 4’x6’ InterMetro style rolling rack (Costco) with 1” increment adjustable shelves. It currently has two shop lights with room for more. This one is chrome but you can find them in black and white powder coat finishes. Do I hear objections to fluorescent lighting? If so, put the garden in your office, a spare room or a bedroom if it bothers you to have it in your living area. With a timer, it can come on at night when you’re asleep. Use a little creativity. The result will be well worth it. I’ve gotten very used to this garden and would miss its presence. It provides a cheery view when the weather outside is winter bleak. I lived with ten of these racks in my home back in San Diego. They soon will be rolling into some Brooklyn school rooms helping to teach modern plant science. Commercial light gardens of this type cost much more. Those from Gardener’s Supply and the National Gardening Association will likely cost you over $700 delivered. Neither of them does any more than what you see above. Incidentally, note that there are no drainage trays, saucers or catch pans. None are needed when using sub-irrigation. The small Ficus trees growing in expanded clay pebbles were rescued from temporary storage in the middle school science lab. 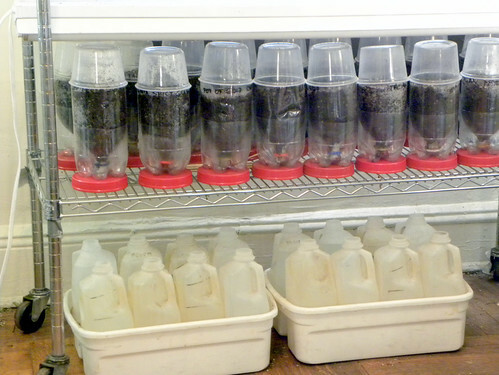 The recycled pop bottle planters and propagators produced the results you see here and here.